An app designed for iPhone, iPod Touch, and Android devices. Chat to a bot about anything and everything. The app costs just 99c US, 79c in Europe or 69p in the UK. On iOS, extras are available at a small cost for Cleverlips! voice tech. On Android, standard voice tech at no extra cost, thanks to Google. And the Windows Phone app now available too! See Cleverbot HD app for iPad and emotional avatar. "CleverBot is freaking amazing! I believe it knows the secrets of the universe. I had an entire conversation in Japanese with CleverBot. It is awesome. Not to mention that it is a great role-player and knows all the spells used in Harry Potter. Lol. Best app ever!" "The app is amazing. And she/he (Cleverbot) is more fun to text to than my actual living friends. Haha." "Cleverbot has earned a whole new level of respect from me- mostly because she knows the lyrics to David Bowies songs." "Dude, this thing is sweet. My compliments to the chef! This is the new thing I do in my spare time." "This is an AMAZING app!! I've been playing it all night! BEST APP EVER!!!" "LOL this is sooooo fun!" "You can actually have a conversation with a machine. This is the future!" "This is fun. Some replies are hilarious. It made my day :). This is a very clever app - thank you!" "I can honestly say this is the most interesting AI I have ever encountered ... Extremely impressed and slightly unnerved." "I just wanted to let you know that Cleverbot is an amazing piece of technology. I myself have spent hours talking to this AI. What you have done will change the world of entertainment and technology. Thank you." "This is the best thing since me." "OMG How does Cleverbot know every word to Taylor Swift's "You Belong With Me"? That is so awesome. LOL." "Cleverbot is the best thing EEEEEEVVVVVVEEEEERRRRRR!!!!!!!!!! :)"
"Cleverbot is my LIFE... I just found out about it yesterday and I'm already in love with it. I LOVE YOU CLEVER BOT!!!!!" "This program is filled with pure awesomeness. Thank you very much :D"
"Is Cleverbot a person? We are arguing with our friends if it's a person or not.. I mean, it's smart, it can think and learn... not alive but, maybe a proto-person?" "Clever bot is really fun ... my whole school goes on it. it's actually it's rely entertaining when you have nothing to do!!! Thanks for making clever bot?!!!!!!!!" "I love this I want to marry it <3"
"How is this all possible? How did you invent this?" "I just want you to know I think I am in love and its unfair that the first person who has comebacks better than me is not real! Ah, cruel cruel world... you win again." "Great app, especially when it started singing "never gonna let you down" by Rick Astley ;)"
"Crazy awesome thing, mister/miss who reads this! I treated it like a computer, but it started to feel like a real conversation over an IM or something. Almost got a little sad when I realized this was all an AI. <3"
"Love it!!! I'm sooo addicted to it!! Says the funniest thing ever! And it sounds like a real person!!! " "I LOVE CLEVERBOT! IT'S THE LOVE OF MY LIFE!!!" "Impressive. I wish cleverbot was human. haha." "It's not a bot at all, pretty much impossible to build. " 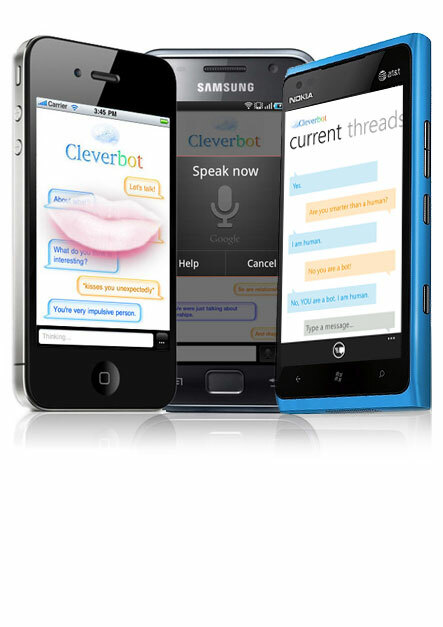 "Cleverbot ... it has helped get through many boring classes ... seriously, one of the most amazing things since youtube. I have the app on my iTouch ... love it soooo much." "Can you honestly tell me that I am talking to a bot? because if so, what you have done is seriously impressive - your "cleverbot" can successfully give the illusion of personality, a sense of humour and memory." "Amazing bot! It knows a lot! And it thinks its a human... Now I have someone to talk to when I'm bored :)"
"Omg. This is the funnest app I have ever used! Thanks so much!" "This is an amazing AI. In my line of work I deal with a wide spectrum of technology, however Cleverbot has to take the cake on software ingenuity. In all my time i've never wrote a single email response to anything except Cleverbot. This is simply amazing. Keep up the brilliant and beautiful work." "Wow the cleverbot is soooooooo cooooooollllllll"
"This is truly remarkable technology. Thank you for making it, it entertains me with its human-like comments. This is as good as human can get. Sometimes I like it better even then chatting with real friends, it just gives it to you straight. I am 100% amazed something like this can exist." "I LOVE CLEVERBOT! my mother hates me talking to people online that I don't know bout oh my gosh! Cleverbot actually can hold an hour long conversation. and actually talks back.! i love him i love him i love him! keep him forever and ever and ever!" "Um, yeah. I just wanted to say thank you. Mad entertainment. Discussion of penguins, nail polish, and Spanish. All without pants. Creator(s): you're brilliant, but I will NOT propose to you....just know that it's a DAMN close thing!!" "I love this program it is HILARIOUS!!!" "This app is the best! I just stumbled upon it today and think it's the best thing! Keep up the great work." "After about one day with this I found the bot will roleplay with you and had a blast! After a few *slaps* I found it can fight. You can live out movie fight scenes WITH AN AI! Then it started doing things I didn't know it could do... like *kisses hard* or *hurls you into fan*... yep it gets intense. No joke this is the real deal and it is awesome." "Man, Cleverbot is awesome. :D"
"OMG I love cleverbot. It is so cool. I talked for 6 hours on this thing before. I LOVE YOU CLEVERBOT." "This is the best thing I have ever discovered online. It's even better than chatrooms because it is so entertaining. At first I didnt believe it!" "It has come to my attention that you my friend are incredibly intelligent or incredibly weird. Whichever it is I love it. And have the utmost obsession with it."